“If she hadn’t come to the facility for medical care, she might not be with us today,” Nurse Telma Saize said of Joana*, a young woman who came to Chabeco Health Facility with a high fever, headaches, muscle pain, vertigo and vomiting. Josefina Ualusso, an MCSP-trained nurse, tested the pregnant woman with a rapid diagnostic test for malaria – the result was positive. The nurse also learned that Joana was HIV-positive and on antiretroviral treatment with prophylactic cotrimoxazole; therefore, she hadn’t been able to receive IPTp-SP (intermittent preventive treatment of malaria in pregnancy with sulfadoxine-pyrimethamine). The two drugs are incompatible and can cause serious side effects. The complexity of the case didn’t stop Ualusso. Trained by MCSP to manage a range of malaria cases, the nurse immediately gave Joana artemether-lumefantrine to take over a three-day period. She also recommended a healthy diet of juice, fruits and vegetables, and that the young woman sleep under a mosquito net every night, something she hadn’t been doing. Two days after completing this treatment, Joana’s condition improved. Although Mozambique has made significant progress in malaria control in recent years, the disease is still a major cause of morbidity and mortality in the country, accounting for 9.6% of deaths in the country. And Zambézia Province – where Chabeco Health Facility is located – has some of the highest prevalence rates of malaria in the country. To meet this need, the Provincial Health Directorate (DPS) and MCSP carried out a series of interventions in the province, including strengthening the skills of providers like Ualusso to properly diagnosis and treat malaria in pregnancy. To prevent the disease, DPS and MCSP also supported the distribution of long-lasting insecticide-treated nets and IPTp-SP at antenatal care visits. Current rates of IPTp coverage in the country are low; less than 22% of women received three or more doses of IPTp during their last pregnancy. (The World Health Organization recommends SP doses at every antenatal visit at least one month apart beginning of the second trimester.) Such prevention is vital to avoiding complications such as miscarriage, stillbirth, premature birth, intrauterine growth delay, low birthweight, and maternal and neonatal anemia and neonatal mortality. The devastating consequences of malaria in pregnancy are well documented. In areas of stable transmission, they include higher rates of maternal anemia and low birth weight babies; in areas of unstable transmission, they include increased risk of severe malaria and death for a pregnant woman, and stillbirth for a fetus. Approximately 11% of neonatal deaths in malaria endemic African countries are due to low birth weight resulting from Plasmodium falciparum infections in pregnancy. Together with the DPS, MCSP also introduced an internationally recognised quality improvement approach called Standards-Based Management and Recognition for malaria, and supported its implementation in 58 health facilities in Zambézia. The Program worked to strengthen the DPS’s capacity to plan, implement and monitor malaria activities and collect, report and use malaria data for timely decision-making processes. Together, these efforts are helping to turn the tide on malaria in heavily hit Zambézia Province. Trained providers – like Nurse Saize, who cared for Joana during a follow-up visit – now say they feel more confident managing malaria in pregnancy correctly. This includes complex cases like Joana’s, where IPTp is not an option. Saize also now takes time to explain to pregnant clients why they may not be eligible to receive IPTp because of their HIV status, and how that may have led to their malaria diagnosis. 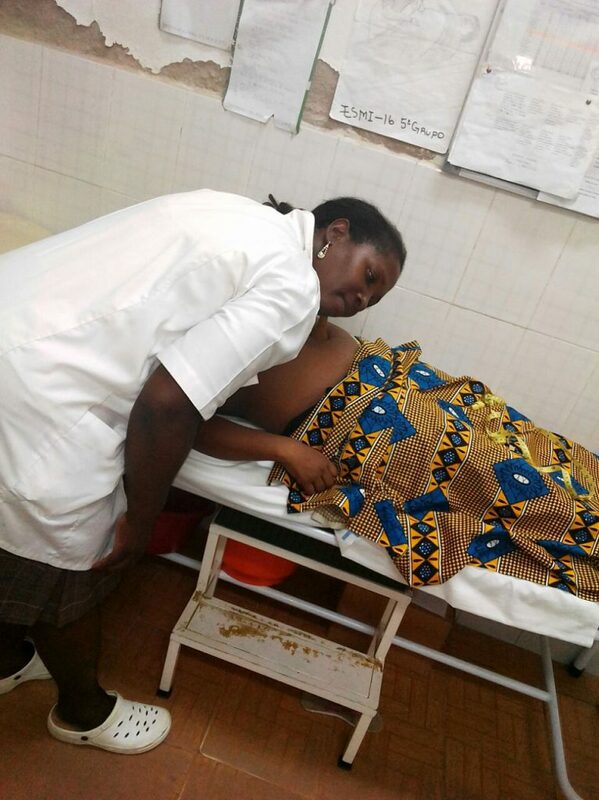 Nurse Saize performing a follow-up exam on a pregnant patient who had malaria. And the evidence isn’t just anecdotal: data provided by the DPS shows a decrease in reported malaria deaths in Zambézia from 339 in 2016 to 182 in 2017 – an estimated reduction of an astounding 46%. Malaria is a dangerous – but fortunately entirely preventable and treatable – disease. Scale-up of malaria prevention and treatment efforts – including widespread use of treated bed nets – led to a 60% global decline in malaria deaths between 2000 and 2015. Ten countries that had the disease in 2000 are now malaria free. And in sub-Saharan Africa, the region hardest hit by the disease, access to malaria tools and services is dramatically increasing for those most vulnerable – pregnant women and children. Moreover, cutting edge treatments in development may keep us ahead of the deadly impact of the disease. MCSP is not taking this progress for granted. The Program remains on the frontlines of efforts to combat the disease in settings like Zambézia Province. When trainings are done, MCSP provides on-site follow-up through supervision and mentorship on malaria case management, especially during pregnancy. The result of this support is competent providers, able to handle their malaria patients’ care, no matter the complexity of their cases. To learn more about MCSP’s malaria work, download our fact sheet and visit the Program’s malaria in pregnancy resource page. And for more information on how we’re helping to end the disease for good, visit MCSP’s malaria microsite. * Name changed to protect the patient’s privacy.